Mother's Day, this year is Sunday, May 12th and always a great day to celebrate love, friendship and moms. Every year I post this blog to celebrate moms. 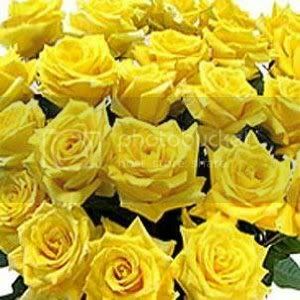 Did you know that yellow roses indicate joy, gladness, friendship and "I Care?" I wanted to celebrate with this photo of beautiful bouquet of 2 dozen yellow roses my husband and I presented to our mom in May 2011 and share her special recipe. As a child my mother would often bake all sorts of foods, pies, desserts, cakes and cookies. 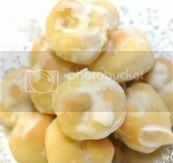 One of my favorite, all time cookies is a famous Italian cookie called "Anginette" (aka Anginetti), in the USA popularly called "Lemon Drop Cookies." 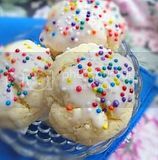 The great thing about this cookie is that it is popular all year round and with just a few ingredients, anyone can prepare and bake this great cookie in less than 30 minutes. I use to always enjoy rolling the dough into extra long cigar shapes and coiling the cookie into 2 and 3 tiers high. 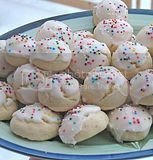 The sky is the limit in regards to creativity; although Anginetti are delightful plain they are lovely and appetizing garnished with frosting and sprinkles. The prep time including rolling the dough into cigar shapes was slightly less than 15 minutes and it baked in 8 minutes. I try to bake these as much as I can. I once baked Anginettes and decided to bring in a tray for an early meeting where I was leading a direct marketing presentation to a group of about 30 people. The cookies were a big hit as was my presentation. Besides adding a personal touch, they were a surprise breakfast treat especially while sipping coffee and tea.